After the hullabaloo on Wall Street and in the media about the comments made by Fed Chairman Jerome Powell and Vice Chairman Richard Clarida this week, the Fed released the minutes of the FOMC meeting on November 7-8. 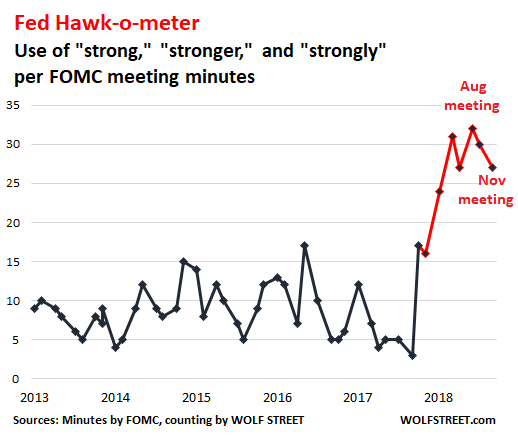 The WOLF STREET Fed hawk-o-meter checks the minutes for signs that the Fed believes the economy is strong and that “accommodation” needs to be further removed by hiking rates. And this is shedding some light on the recent comments. The average frequency of “strong,” “strongly,” and “stronger” between January 2013 and December 2017 was 8.7 times per meeting minutes. In the November meeting minutes, it was 27 times – an increase of 210% from average. The average over the past five meeting minutes (May, June, August, September, November) was 29.4 times. “Growth of business fixed investment had moderated recently from its rapid pace earlier in the year. So this economy is still rocking and rolling, according to the minutes, but there are a few spots where the beat slowed down a little. This rate hike at the December 18-19 meeting would bring the Fed’s target for the federal funds rate to a range between 2.25% and 2.5%. This is up from a range between 0% and 0.25% before the Fed started raising rates three years ago. The “effective” federal funds rate, as of today, is 2.20%. Since last year, it has been near the top, rather than in the middle, of the Fed’s target range, somewhat perplexing the Fed and causing it to make a minor adjustment to the interest on excess reserves (IOER) that it pays the banks in order to bring the federal funds rate into the middle of the target range, so far without success. At this pace, the effective federal funds rate may be around 2.45% after a December hike. So how far below “neutral” would this 2.45% be? The “neutral” federal funds rate is a theoretical concept rather than a hard number. It’s the federal funds rate that would be high enough to not stimulate the economy and low enough to not slow it down either. Every member of the FOMC projects what this “neutral” rate is in their opinion. Their projections range from 2.5% to 3.5%, with the median projection of 3%. This is where “neutral = 3%” comes from. When Powell said in his speech a couple of days ago, that the federal funds rate was “just below” neutral, it was in light of these numbers. No one knows what “just below” means – so one hike in December and one or two rate hikes next year? And after the Fed gets to its “neutral,” wherever that may be, what’s next? Powell left it purposefully to our imagination, and Wall Street sure imagined God knows what. Many participants indicated that it might be appropriate at some upcoming meetings to begin to transition to statement language that placed greater emphasis on the evaluation of incoming data in assessing the economic and policy outlook; such a change would help to convey the Committee’s flexible approach in responding to changing economic circumstances. Sure, as the rate gets closer to neutral, the language about future clockwork rate increases will need to be revised. And why should there be any references to future rate hikes? This type of “forward guidance” is an invention of the Bernanke Fed. The Powell Fed has been discussing for months to get away from forward guidance to free its hands and re-introduce a level of surprise in each of its meetings starting in 2019. Several participants were concerned that the high level of debt in the nonfinancial business sector, and especially the high level of leveraged loans, made the economy more vulnerable to a sharp pullback in credit availability, which could exacerbate the effects of a negative shock on economic activity. This potential “negative shock” from the direction of business debts, including commercial real estate, that could impact financial stability is a central topic in the Fed’s first Financial Stability report released this week, which I will cover next. .. sorry about the mixed metaphors .. Speaking of metaphors, Polecat, you do know what “the yellow brick road” referred to? The current iteration of the CB didn’t appear until well after the book was written. But, I think it’s worth knowing the why and wherefore of the Federal Reserve. By definition, the Fed’s doing an excellent job, especially in light of the fact that it effectively stopped a “bank panic” in 2008. A bank panic in 1907 is what set Congress in motion to create the FED. Except the fed arguably created the boom preceding the quadi-2008 bust and the bad debt still has not been allowed to clear; too many beautiful people own it. And does the use of the words “broad range of estimates” distance his personal view from the statement? Your Fed meter is interesting but I question whether it has any predictive utility. As for me, I agree with the market and believe we are about to get some serious Fed stimulus. Fiscal stimulus: pedal to the floor. Monetary Stimulus: pedal to the floor. Dollar: taken round back and given a bullet to the head. Looks to me like Powell is finding his “courage to act” and has begun the process of reversing policy by ending this so called tightening cycle. First comes the talk of rates having achieved a neutral rate and soon to be followed by negative interest rates and outright monetization of expanding deficits. Looking at a 40 year chart of interest rates what you see is a continuation of lower highs and lower lows. It looks like this interest rate cycle will reach a high of around 2.35% and then reverse to a new low into negative territory. The balance sheet will once again expand and the Fed will never again be allowed to pretend it will shrink. Three years of so called tightening and rates still hover around 2% and balance sheet still bloated. If you still believe at this point it’s only because you need to delude yourself. Have a great weekend. Van, last time you felt this dovish you bought Facebook at $187 after its first drop. I hope you got rid of it shortly thereafter. I think this whole deal will spin out of control shortly, and the doves dreaming of Goldilocks economy will get the witch instead. If you look at for how long the Fed usually tightens before leveling off and reversing we’re almost there so based off Powell’s comments I don’t think the Fed necessarily came to some revelation. They will continue to tighten and level off next year, probably lowering rates only if the bond market crashes. After that we’ll be in a real mess and yes perhaps they will actually take interest rates negative… That will not be just a mystical following of the trendline but a necessity to prop up the system. The thing is, we’ll be looking a lot more like Japan. There is no guarantee the stock market will come back quickly after that. Financial repression will again rule in America and retirees everywhere will be weeping. Hm, I didn’t know the market said this. Guess I missed that! The problem with that view is we’re not even in a recession yet. So the Fed chair is “about to” declare this whole ‘fantastic recovery’ a fraud and out himself as a ridiculous liar? Don’t think so. How many times in the past year has Powell described our economy as strong, healthy, thriving, growing, wonderful wonderful wonderful? If he reversed course now when we’re still well below “normal” rates Trump might like it but I don’t think think anyone with a rational mind would. Are you proposing a new theory which can be summed up by the formula: debt x interest rates = constant? Rate Normalization would be on the order of 5% which is significant enough to instill confidence in market stability assuming that if markets were to ever crash in the future there would be room for the CB to manipulate rates down instead of into the NIRP territory which creates market volatility due to rate instability. Normal rates are historically known so that we do indeed know what the average rate over time has been within productive times economically. In brief, rate normalization is the accepted market rate that is least likely to slow investment in the face of rising rates of inflation that must be maintained according to runaway inflation prospects for the near term. The Superman Powell Put is nowhere near rate normalization but the CB brain trust wants him to offer false platitudes of hope so that that guy in the White House does not throw another conniption fit and go twittersphere on his reputation and Christmas card list plans for the season. Heck, Powell is only human and wants to keep his job, eh. Can you imagine going home this Christmas season with a pink slip from the bureaucracy? I wonder if the banks will welcome rate hikes more than they will Maxine Waters when she become the head of the House Financial Services Committee? Which will help the savers more? Uhh … BW above … I must have missed something. During Obama’s reign, first the Honorable bearded Mr. Ben ‘All is Contained’ Bernacke, followed by the ever stupifying Ol’ Yellen into most of Trump’s first term in office, were the Fed Chairpersons of note … unless Mr. Powell is a superb F X master. You missed the point, Polecat: for some, every problem on the planet was caused by Barack Obama (or the Clintons, take your pick). They’ve drank the Fox News Kool-Aid. Facts do not matter to them. You need to put down that cup of faux juice …. Wolf, have you been monitoring this lately? Categories 3yrs 11 yrs have gone so high lately. Way high. Where do the primary dealers get all the money to buy these Treasuries? Out of thin air? Is it possible all the talk about a rate breather is to provide some cover so the primary dealers can offload a few billions? Is this a form of surreptitious QE? The Fed just re-invested $29.22 Billion in T’s for November. What’s a few more Bs.? 1). Achieve “neutral” interest rates. 2). Neutralize danger of high leverage loans. A: Implement neutral rates NOW not spend 3 years to do it. B: Immediately implement a regulatory regime NOW that totally neutralizes the danger of leveraged loans by using the Fed’s vast authority to do so. The 3 years the Fed took to gradually raise rates to head off asset inflation, saw a vast increase in the inflation of asset prices. By Fed own measure, it has totally utterly failed on this front in a massive way. By the Fed’s measure alone, the Fed’s “gradual” approach as been a total, complete, 100%, incontrovertible catastrophic failure. If the Fed had immediately adjusted to 3% in 1 day, the Fed would have achieved an enormously better success at preventing asset inflation we have been told the Fed wanted to fix. instead of the less volatile route of small incremental rate rises which avoids the pitfalls of blowing the whole world up in one day which is also not very prudent if one likes living to see the next day, eh. Bulls in china shops don’t make for good management. You are missing this. The shop front of FED is their stated goals of “neautral rate, economy and employment”. The real job is to transfer wealth out of your hands and transfer liability into your hands. That “transfer” must be done with a cover, and it can NOT be too obvious, so it has to be done “subtle, slow,date dependent, seemingly economic and political related”. Hi Everyone, apologies for being behind with everything. Thursday morning, we left San Francisco to go to Japan to visit my in-laws. From door-to-door, this is quite a trip, and when we got here (Friday night Japan time), we had dinner all of us together, and then I dealt with the comments for a while before I crashed. So I’m way behind with everything. Wow that looks great! Oichi. I shall bring out my Zojurushi Fish fryer and cook some Saba and Sanma. Beats reading the November vulnerability report. My … that looks mighty tasty, Wolf. Bet that’ll do wonders for your jet lag !! What a nice MIL you have .. Courious question: Does she butterfly the fish before, or after she grills it ?? She butterflies it before grilling. They have a special fish grill under the range (they don’t have an oven however). Because this little fish gets so crispy, you can eat the tail, the fins, and part of the head. I love those parts. Very tasty. Her work is amazing.. Very fine work.. Indeed. She is very talented. Her attention to detail is evident in her art as well as in her food. Looks delicious, hope you have a wonderful visit. Gather ye rosebuds while ye may! It’s evident to me, by this picture, that the American diet of pepperoni sticks & cheetos is far superior and healthy..
Sure are a lot of dishes to clean . Could not agree more Memento mori. Taste aside, I like to translate it into a formula: throughout your life, you’re assigned by nature x tons of food (calories, depending on your height) to eat. It is your choice whether you eat through it in 50 or 100 years. lovely to see. my wife is from korea and breakfast there is similar but slightly spicier. we have a lot to learn about health from the people of east asia. from the comments here, you would think that there is no world outside of the u s of a. personally, i think that what powell does is of less import than the crisis brewing in eurozone. I find this Wolf’s Hawk-o-meter as interesting project for my beginner programing tasks. What other words would members here suggest, that would be interesting to try to track and analyze? Hyperinflation i alrady put on the list. Will add contagion, thanks. Interesting thought about “most harmless sounding synonyms” for Impeachment and Revolution. You got me chuckling, but you are making an interesting point. As non native english speaker i would have hard time comming up with any of them, do you happen to have some sugestions? Nltk, will have to wait for now, right now in learning Pandas. Yes, im already calculating freequency of all words, but for now im going to focus on (subjective) ‘important’ words. Wolf, glad to see you back to posting articles. I was worried about some kind of problem as you usually post an article or two daily. Now my comment, I love your hawk-o-meter, a microscope on the bull**** spewing from the FED, but think that it might be the last way to view the insanity of the USA financial system with justification or any merit or validation. Kick the last can comes to mind !! Note that phrasing: below the “BROAD RANGE of estimates”. Powell is saying that FFR is near the LOWER end of the BROAD numerical range of estimates/opinions by FOMC members as to what constitutes the “neutral” rate (as seen in the famous “dot plots”). Wall Street is misinterpreting Jerome Powell as turning dovish. He is not. Gradual FFR interest rate increases will continue, and so will QE-unwind. You got to be kidding, negative interest rates are right around the corner in America. Remember at some point in time the Fed will tell the truth which is America never came out of the last recession. From what I see myths and demonization are the key tools of changing administrations, not admitting to mistakes unless it can be foisted off. In short, it depends on who is in power at the time as to who and what gets blamed. The blame game will indicate what remedies will be taken. Not mentioning any names here, but someone might blame Powell and demand rapidly lowering of interest rates if and when this debt binge day of reckoning goes off the rails. And another administration might demand an FDR infrastructure rebuild program to put people to work and quiet a brewing insurrection. One thing is clear, whatever happens circumstances will be used to promote a specific agenda to help and boost a specific interest group. As my recently deceased Mother used to say (age 98 and a Great Depression and WW2 survivor), “There’s always money if ‘they’ want it and it suits their interests. There’s money for war, money for weapons, money for pet projects. There’s always money. Don’t fool yourself”. Soliciting ideas for 2018’s wrap up post Wolf? Hoping to read a summary of the years QE unwind and estimates for 2019. Have a great trip, read you soon. Agreed. I think Powell is trying jawbone the markets to reduce the current anxiety and volatility. Nothing has actually changed in his outlook. At the last meeting he said we are far from neutral. This time we are close to neutral in a broad range. It’s the difference between 6 and a half dozen to me. Essentially it is this. If there were to be a financial crisis, experience has shown the costs to the broader economy are substantial, and are born by society. Saying we have capitalism or a free market economy is all pseudo economic rubbish. The Fed controls interest rates which means it controls all prices in the economy. It is no different than communism. Greenspan and Bernancke were frauds. They knew exactly what they were doing creating bubbles to make themselves look good with low interest rates. Greenspan”s first book out of office was “The Age of Turbulence” because he knew what he created over 3 decades. All to please POTUS to keep his “Maestro” status. Does anyone listen to this Maestro now? No. We all know what he did and it was not for the economy, but for his name sake. Powell is trying to deflate the over inflated stock market and home prices. Anyone who thinks they made money since 2009 is in a delusionary state and simply does not understand the hype. Why dont you enlighten us as to how the central bank’s for does not lead to massive price distortions from the insane pulling forward of demand? They likely called Madoff ‘maestro’ too until the FBI booked him into the big house for life. Madoff got something like 150 years consecutive by the nice man on the bench. Thank you very much for putting matters right: I am still amazed at the downright falsities the Wall Street crybabies circulated over the past couple of days and a tad worried at how easily people fell for them. Then trump added that the “Fed was “way off base with what they’re doing.” So far, he was “not even a little bit happy” with his selection of Powell as its chairman. The very next day, with nothing having changed in 2 months save but a small 10% drop in the market, Powell immediately backtracked and caved. Can we stop pretending anything other than the stock market matters to trump? Stock market up – economy great!! Stock market down – economy bad. Sad! “Can we stop pretending anything other than the stock market matters to trump?” – He cares deeply about tariffs! Stock Market Up- Thanks to me! Stock market down- thanks to Powell. Sad. By the way, Trump has been hounding Powell for months, so if Powell was going to cave, he would have done so already. Or maybe Trump is making sure that when the big fat everything bubble blows, the blame lands squarely where it belongs, on the Fed. Given the attention span of the average voter, it doesnt matter the reason so long as the blame doesnt land on the oval office, especially for that marginal voter who hasnt blindly sworn allegiance to the purple team. Maybe a dumb question, but isn’t this explaination backwards? A Fed rate too high would slow down the economy but one too low would excessively stimulate it? A neutral rate would neither stimulate nor slow down the economy. It seems the quantitative tightening is just as important as the interest rate. What is the projection there? For now, it’s on automatic pilot, following the track outlined last year. Mikie, I had exactly the same thought. The Fed Funds rate determines the PRICE of money, but QT will determine, over time, the AVAILABILITY of money. The removal of a few hundred billion from the Fed’s balance sheet over the past two years, done in a slow, methodical pace, was largely offset by fiscal stimulus from tax cuts and increased federal spending. The latter will end in 2019, and the rate at which QT proceeds is on autopilot at $50 billion per month. This will surely have an impact on monetary conditions, and in turn, the “Everything Bubble”. Another point to consider is the impact of Trump’s tariffs (which I support, but recognize they have a cost). The revenues the Treasury is raking in from them are in the tens of billions of dollars, annualized. This is only the direct cost: price increases due to steel/aluminum quotas are in addition to this, and will further offset the stimulus from the tax cuts and spending increases. Trump is also rumored to be considering an across the board reduction of 5% of all Federal spending (excluding Defense) in his next budget. At best, with split control of Congress, there is unlikely to be any further increase in Federal spending in excess of inflation. All of this is to say that as the slowdown in the economy becomes more apparent to the Fed, it is likely to pare back QT or halt it altogether, and reduce the number of interest rate increases “pencilled in” for 2019-2020. Direct negative interest rates are very unlikely in IOUSA, but effective interest rates, if QT is slowed, halted or reversed, could in fact become negative, depending upon the Fed’s policies. One could argue that this might be limited to IOUSA alone, but the ECB, BoJ, BoC and BoE are also raising rates, and some are pursuing their own form of QT. Given all of this, I’d argue that monetary conditions, and thus the effective Fed Funds rate, are much tighter and higher than the actual Fed Funds rate alone would suggest. Mikie, I omitted the following link https://www.frbatlanta.org/cqer/research/shadow_rate.aspx?panel=1 from my comment. It takes into account not only the Fed Funds Rate, but the impact of QE or QT. It described the Wu-Xia Shadow Federal Funds Rate and is described in more detail on the Atlanta Fed’s site. According to the Fed’s Board of Governors, the current Wu-Xia Fed Funds Rate is closer to 5.5%, much higher than the 2.25% nominal rate. Here is an O-Meter the thread might find useful. The model has a projection element for house prices in Canadian cities. Many making the point that the Fed Funds Rate is the primary mover. I believe the QE unwind (happening at a monthly clip so its out of mind) is having a far more reaching effect on liquidity and therefore markets than anticipated. While I also believe as a matter of practice the Fed Balance Sheet should have been liquidated first followed by a plan to raise rates, since the Fed and our Congress have decided to do both, perhaps its the QE unwind that should be moderately slowed. Selfishly perhaps, I look forward to a 5% 10 year I can buy for my retirement fund. this is of greater importance to many than the support of bubble markets. You may be on to something here: real rates in Europe started to tick upwards the minute Mr Draghi capitulated and announced an end to QE. If savers shop around and threaten to walk away they may even get something akin to a deal these days. Note that until the end of the year everything is unchanged: it was the mere announcement, well phoned in advance and worded in the most dovish way possible, which caused this uptick in interest rates. Imagine what will happen once the unwind starts in its earnest. But honestly I don’t think the Fed will do anything about QE Unwind, at least if Treasuries yields and mortgage rates keep on growing at present pace. Budget shortfalls are not the Fed’s responsibility and real estate is one of the asset bubbles the Fed is most concerned about. Remember what they are trying to do is deflate asset bubbles in the most orderly way possible, not steal a page from the People’s Bank of China and flood capital markets with liquidity the second somebody takes to the streets beating on his pan. Rebuilding the credibility Greenspan and Bernanke destroyed will take years. Looks like the Bank of Canada has become “concerned”. It’s now buying assets from government owned corporations, with money they’re authorized to print by the government, secured by assets guaranteed by government! What could go wrong? This is being done in an attempt to provide liquidity into a quickly shrinking credit market and to shore up banks reserve requirements. Next up? An interest rate roll back, with an expansion of the Bank of Canada’s balance sheet, with possibly the purchase of private equities? Looks like the BoC is striking first, leading the way this time! Could the Fed be not far behind? Or are they going to play pin-the-tail a little longer? A man owes a 1000 Euro and earns 1 Euro a year, (lets call the man Italy), he cant repay his loan so what does the man owed money, the creditor do, (lets call him Germany). Germany has a quiet word with the issuer of currency, lets call him ECB , (European Central Bank), and tells him to issue a new currency, lets call it the Euro Nouveau, EN for short, this new currency, since it is fiat costs ECB nothing, so no loss to him, and he hasn’t broken any of his own rules relating to Euro lending since it is now the EN not the Euro, thus he keeps his important job, gets lots of praise, and is happy. The EN is issued at the rate of 1EN =1000 Euro, Italy gets issued with 10, Germany gets 13 because he is bigger, so it is only fair. Italy pays Germany 1EN and is now debt free, (remember 1EN = 1000 Euro), Italy keeps 3 and borrows at 2-1 against the other 6 placed on deposit with the ECB, Italy has now repaid its unpayable debt, so Germany is happy, AND Italy now has 15 EN, (6×2=12+3), to spend on his bridges and healthcare, so he is happy. Germany has 14 EN on deposit and no worries about how Italy will repay its loans, more happiness. For Italy swap student debt, commercial paper, Venezuela, Argentina, Germany, the US dollar, the Pound Sterling, etc etc, whatever the powers that be decide they need. i seem to recall that a short while ago there was a suggestion that the US Treasury minted a large platinum coin with a face value of I trillion dollars and used it to pay off most of the US debt. As long as the powers that be can issue any fiat currency or other variety of IOU, (either in parallel with or instead of their current fiat paper), they choose and at any value they like then all crisis’s can be largely avoided bar a few little people losing it all, (got any gold? ), don’t believe me? how many dollars have there been already, look at your own monetary history. Glad you mentioned Argentina, exhibit A of what happens when a country goes overboard paying for state expenditures with money the government creates. The central bank of Argentina is under the Ministry of Finance. This is a very convenient setup, but it destroys the currency. Compare the value of the peso to the value of the dollar over the past 20 years. Greece’s drachma was managed similarly. Argentina’s problem is that it and its businesses can no longer borrow long-term in pesos at a reasonable interest rate because no one trusts its management of the currency. So Argentina has to borrow in dollars, and then it defaults on its dollar debts, and then it can’t borrow in dollars either, and the economy crashes. Rinse and repeat. I like the Hawk-O-Meter. Are there any dove sightings? The Fed might be making a mistake by assuming GDP projections are going to taper off. This is really more like the Yellen Fed, reacting to data? It was always the assumption (the market always dissed it) that the Fed would drive straight through to 3.5%, after Yellen dithered. Now more dithering? I tried various key words for dovish settings, but with each one I got too much noise and not a clear signal. “Strong” also leads to noise (i.e. “not as strong as”), but so far that noise level has been about the same and hasn’t materially altered the trend, though I need to keep my eyes on it. I keep looking for other phrases that might point to a change in direction. The thing with these minutes is that they’re super repetitive. The prose is terrible. They keep using similar phrases over and over again. Reading these minutes is mind-numbing, and that’s the only reason why I can even attempt to do this hawk-o-meter. I couldn’t do that with a well-written summary of the meetings. 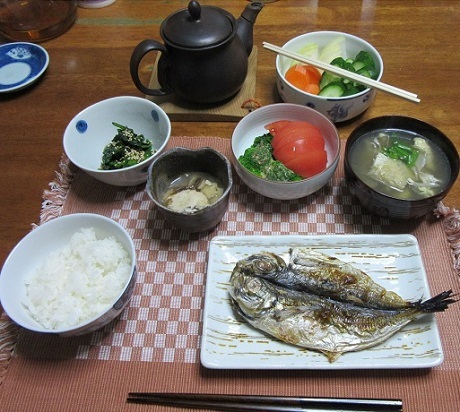 Mama San’s Bkfst looks delicious. I could it that every day. She is so talented. I am sure your wife takes after Mama San. Paulo want to come to your home for Bkfst. I am concerned that we need to have interest rates normalized & a bit higher. We are bankrupting our future generations with our high debt that we can’t pay back. But, we can’t keep on with these low rates as it is reckless gambling.